Video which some news outlets claimed had showed Libyans trying to save Ambassador Stevens turns out to show the opposite. A video released over the weekend, which some news outlets claimed had showed Libyan men trying to save U.S. Ambassador Chris Stevens as his body is recovered from the U.S. Consulate in Benghazi, has turned out to show the opposite. Arutz Sheva posted a report on the video with the translation given by prominent news sources, but raised immediate doubts as to the authenticity of its interpretation, which have now been shown to be well founded. According to an alternative translation provided to Alex Jones' Infowars by a native Arabic speaker, there is no evidence whatsoever that the men in the video are pleased Stevens is still alive or are trying to rescue him. In fact, the video appears to show the men celebrating the fact that he is dead. Stevens is hauled out of the window and dumped on the floor as the men stick cameras in his face, fist pump the air and chant, “Allahu Akbar” (G-d is great), which is routinely shouted by Islamic radicals following a successful attack. There is no indication whatsoever that the men are attempting to save Stevens’ life or get him to a hospital. Note: Viewer discretion is advised as the video is somewhat graphic. Stevens' body is clearly visible, albeit briefly, about halfway through. Right at the start of the clip, the men are heard shouting “sawer sawer,” meaning “film, film,” hardly the actions of people concerned with saving a dying man, noted Infowars. “At no point does someone say ‘he’s alive’ after the body is pulled out,” the Arabic speaker told the site, adding that the men seem very excited to see Stevens’ body, overwhelmingly suggesting they are reveling in his death, not trying to save his life. The video also contradicts reports that Stevens managed to escape the consulate but was killed either en route or inside a nearby safe house. Reports in other outlets indicated that the one of the men said: "Is there a doctor around? Does anyone know a doctor?” Another person was reported to have checked the pulse of the victim. “Move, move, he is still alive! Alive, Alive! G-d is great,” the report quoted the men as saying as someone calls to bring Stevens to a car. Infowars noted that the New York Times’ translation of the video appears to have originated from a Twitter user who supported both the U.S.-backed assault in Libya and the attempt to topple President Bashar Assad in Syria by supporting the same Islamic militants. Meanwhile on Thursday, CNN reported that Stevens had said he was on Al-Qaeda’s hit list. A source familiar with Stevens' thinking told CNN that in the months leading up to his death, Stevens had been worried about Al-Qaeda’s stepped-up presence in Libya and mentioned that his name was on an Al-Qaeda hit list. U.S. Secretary of State Hillary Clinton, however, was quoted by CNN as having said Thursday she has "absolutely no information or reason to believe there is any basis" to suggest that Stevens believed he was on an Al-Qaeda hit list. Also on Thursday the White House, after insisting for eight days that the deadly attack on the consulate in Benghazi was a "spontaneous" act, conceded that it was "self evident" that it was an act of terror. The 9/11 date was seen as not coincidental. 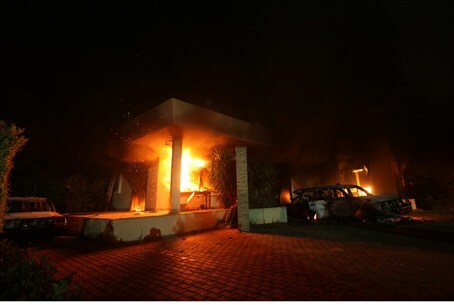 As the search continues for those directly involved in the attack on the embassy in Benghazi, it was revealed Thursday that a former inmate of the Gunatanamo Bay detention facility may have been the leader of the attack. Former inmate Sufyan Ben Qumu, one of the leaders of Ansar al-Sharia, a militant Islamist group based in Derna, Libya, has been identified by local officials as being involved in the attack in Benghazi that killed the ambassador. Click here for Phyllis Chesler's analysis.